Hair wash day for McKenna used to be the most dreaded day in our house. It didn't matter how gentle we were or which parent had the honor of completing this task, we all absolutely hated it! For the past couple of months I've switched up the way we do things so it's a much more enjoyable task for all those involved. Keep reading to find out how and my favorite items for tear-free wash days! This post contains affiliate links. If you click on or make a purchase using these links, I may earn a small commission AT NO ADDITIONAL COST to you. Thank you for supporting Truly Yours, A. by using these links! The first thing I did was change how I washed McKenna's hair. We used to do it in the tub during bath time and it was an absolute nightmare. I honestly don't think we made it through a night without her screaming and crying. Instead of the tub, I now wash her hair at our (thoroughly cleaned) kitchen sink. She can lay back and play with a toy while I wash her hair uninterrupted. Now her bath times are more pleasant and enjoyable for us all! 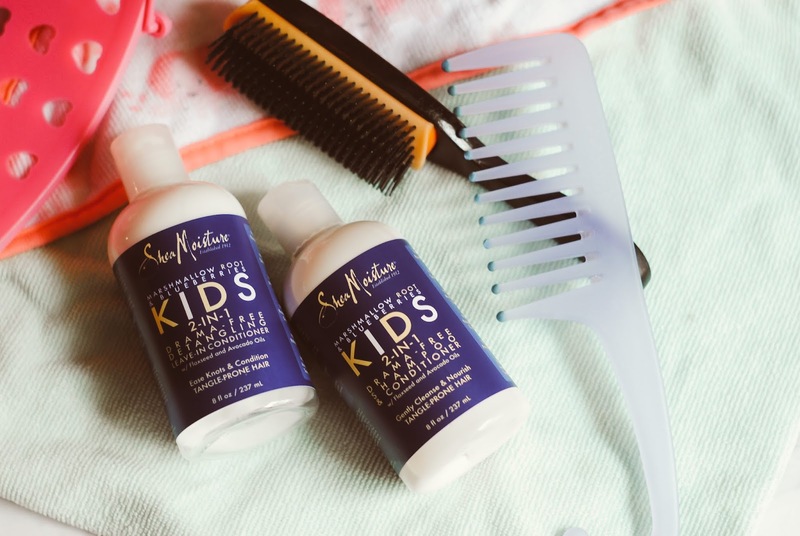 SheaMoisture Marshmallow Root & Blueberries Kids 2-in-1 Shampoo & Conditioner - This cleansing conditioner is perfect for tiny curly girls: its so moisturizing, has amazing slip, and cleanses without completely stripping hair. SheaMoisture Marshmallow Root & Blueberries Kids 2-in-1 Detangling Leave-In Conditioner - This detangling leave-in truly makes McKenna's hair so easy to comb and super soft. I also love that it contains organic ingredients. Using this product and the matching shampoo/conditioner make her hair more manageable and smelling like blueberries for the rest of the week! Shower comb - A wide-toothed comb is super important for gently removing tangles and distributing product, like deep conditioner, throughout the hair. Denman brush - For even better detangling after combing I like to use a brush like this one. Denman brushes are great for detangling and minimizing breakage on textured hair. After McKenna's hair is washed and I've applied the leave-in I style it, which lasts for a couple days before I have to moisturize and restyle it. I plan on doing another post on our everyday toddler natural hair routine and all the products I use to grow her hair, so keep checking back for that! 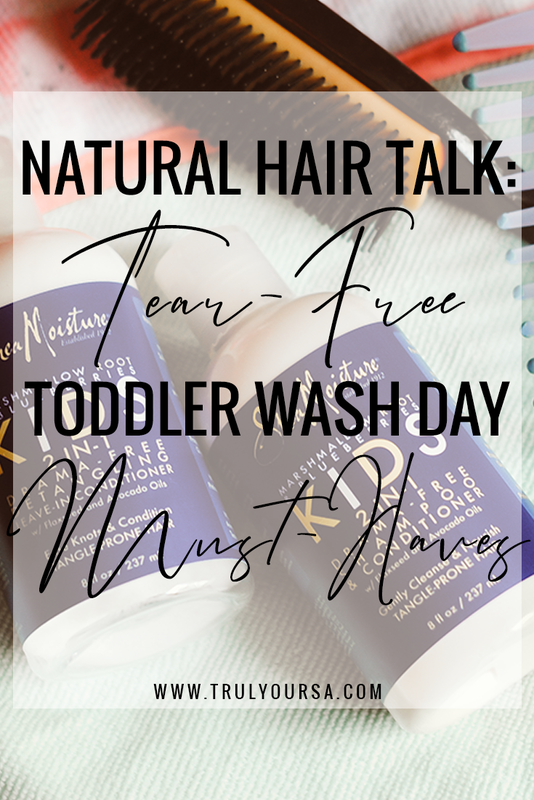 What are your favorite products for your toddler's natural hair? Let me know in the comments below! And please share this post using the buttons below. Thanks so much for supporting Truly Yours, A. and me! Like this? Pin me, please! I don't have any children yet but I LOVE shea moisture. I also find that using a detangling brush in my natural hair makes life so much easier lol. Thank you for sharing this! Wash day with my toddler isn't a fun task. I love all her curls and it could be fun, but she hates getting her hair done. 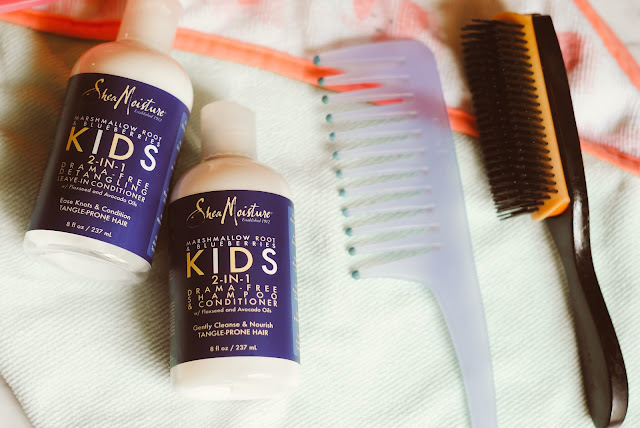 I've tried the SSheaMoisture Marshmallow Root & Blueberries Kids 2-in-1 Detangling Leave-In Conditioner and I love it! I haven't tried the 2-in-1 shampoo/conditioner yet. I didn't even know Shea Moisture had a kids line. Major news to me! I bet it smells amazing and works wonders!